Yesterday I pulled out an old Ambika #5 Jack plane that I had discarded some years ago. That was when I was relatively new to woodworking and was struggling to get a hand plane to work. I didn’t know too much about sharpening or about planes in general. I went through several planes, junking most of them until I settled for a brand that makes good planes. Yesterday, however, I decided to pull out the old plane because I was working more and more with my two Shobha Jack Planes (a #5 and a #5 ½ ). These planes are great at levelling wood and doing most of the work in flattening pieces. I thought I would convert the old Ambika into a scrub plane of sorts by adding a cambered blade iron. I checked the Ambika sole for flat and found it was pretty good but decided to do a bit of flattening for good measure. I have found that silicon carbide powder (66 grit), which is relatively easy to locate in milling stores, does fast work of removing metal. I put a bit of the powder on a 320 grit sandpaper stuck on a piece of flat glass and gave it a good rub for a few minutes and the sole was done. 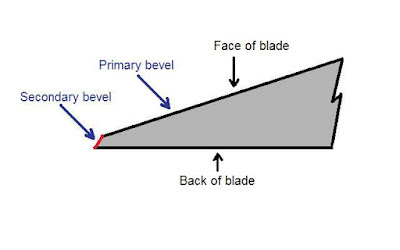 I gave the blade a very slight camber and honed a fine secondary (or micro?) bevel on it. That was that and the plane worked like a charm. I was astounded! Made me wonder why I had junked it in the first place; realised it was because of my inexperience. The plane was sound but not my sharpening at that point of time. I also did not know how to adjust the iron so that it was perfectly parallel with the sole. Now that I know better I realise a low cost plane is not necessarily a bad plane because it is cheap. I now have a terrific Ambika Jack plane for which I would have paid just Rs 600 or so. It works as good as my more expensive planes and takes off super fine shavings. I tried it on a piece of White Oak and it worked like a darling! I think wooden planes are much better & easy to use. I am still learning hand planning. Skill & experience are more important than a perfect tool. A professional can build any big project with just few hand tools.I have lots of power tools but cant dare to beat a professional. Well said, Kishore. I could not agree more. Look sharp. A DIYer should learn the sharpen first. I learns it the hard way.